Today marks the 130th Anniversary of the Parcel Post, which began on 1st August 1883. At the time, the service was regarded as the greatest revolution in the postal system since the introduction of Uniform Penny Postage some 40 years previously. The BPMA Archives contains a wealth of material on the Parcel Post and this blog is by no means intended to be an exhaustive account. Instead, I hope to give a brief overview of the context behind the introduction of the service and some idea of its impact. 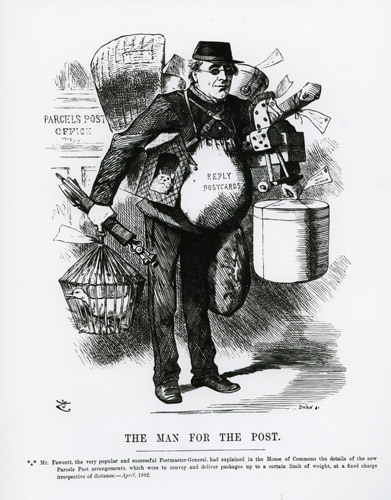 The idea for a Parcel Post was suggested by Rowland Hill as early as 1842 and was raised again by Hill’s younger brother Frederick in the 1860s. In the meantime, the Post Office did go some way towards a parcels service by launching the popular Book Post service in 1848 followed by the Pattern Post (a service for posting manufacturer’s samples, a sort of early version of catalogue shopping) in 1863. It was of course possible to send a parcel before 1883 and there were several large courier companies operating nationwide parcel services using stage coaches. By 1850, the Railway Companies had monopolised the market, making them a powerful opponent to any Post Office enterprise. The Post Office had previously tried at length to negotiate with the Railway Companies during the late 1860s, but to no avail. The impetus for the Post Office to re-enter negotiations with the Railway Companies was provided by the Universal Postal Union Conference, held in Paris in 1880. Delegates proposed the establishment of an International Parcel Post, to commence in 1882. In order to participate, the British Post Office would first need to establish an Inland Parcel Post service. This task fell to the then Postmaster-General Professor Henry Fawcett. Fawcett was a strong advocate for Parcel Post and in a letter to his father in April 1883, he cited the Parcel Post as top of his list of 5 things he felt needed to be done within the Post Office. His main concern was to prevent any ‘dislocation of the letter service’. Fawcett was assisted in the negotiations by Mr F.E. Baines, who was appointed the Inspector General of Mails in 1882 and had the honour of sending the first parcel by ‘Parcel Post’. 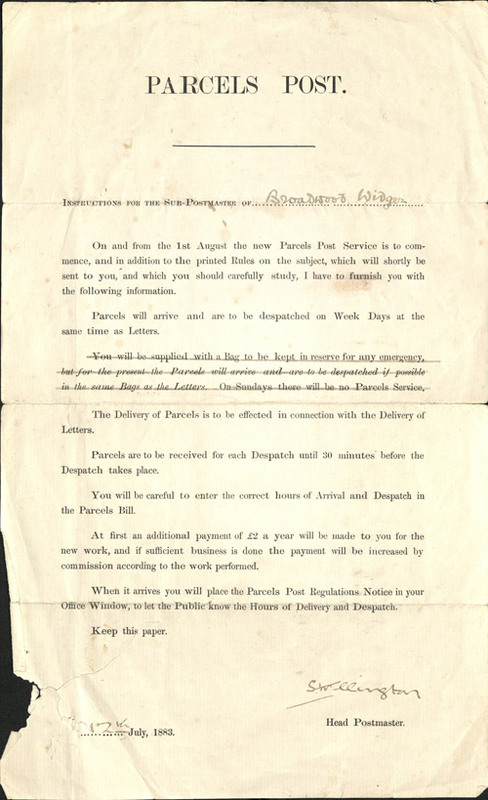 The Railway Companies eventually agreed to terms which would give them 55% of the gross postage of all parcels carried by rail and The Post Office (Parcels) Act was passed on 18th August 1882, with nearly a full year passing until the service could be brought into operation in 1st August 1883. Given the scale of the preparations involved, it is rather remarkable that this was achieved in only a year! The introduction of the Parcel Post meant rebuilding or adapting nearly 1,000 Head or Branch Post Offices, as well as arranging collection and distribution in more than 15,000 postal districts. It also meant an immediate change to the workload of the former letter carriers – now to be known at postmen. Wicker baskets and handcarts were required for sorting and transporting parcels, each Post Office counter required scales and were issued with specifically designed cork handstamps to cancel the stamps on parcels. 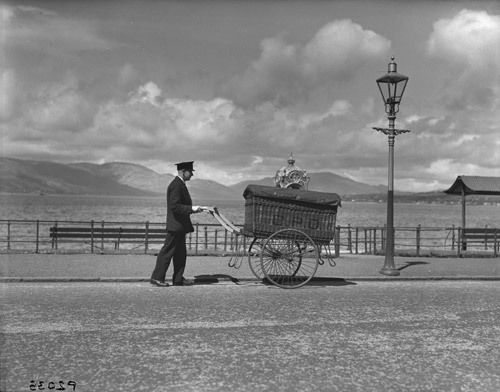 Every letter carrier’s walk had to be altered so they did not have too heavy a load and allowances were made for the use of a horse and cart, tricycle or pony to aid parcel delivery. Crucially, the public had to be made aware of the new service and four-page handbills were distributed to every household in the British Isles notifying the changes. Never before did any Commercial House leap all at once into so gigantic a concern, with 15,000 agencies and thirty-five million possible in these three kingdoms, never before, it is thought, was a Government department put to so severe a test as that which, twelve days hence, will await the one over which Professor Fawcett presides. on the whole, the very important and very anxious experiment of yesterday seems to have passed off satisfactorily. the only difficulty has arisen from the public inexperience in the art of packing. Parcel Post saw the introduction of variety of carts and cycles as new ways of transporting the heavy mails had to be found. It also prompted a return to long distance haulage by road and the introduction of horse-drawn parcel mail coaches in 1887, which were operated under contract. 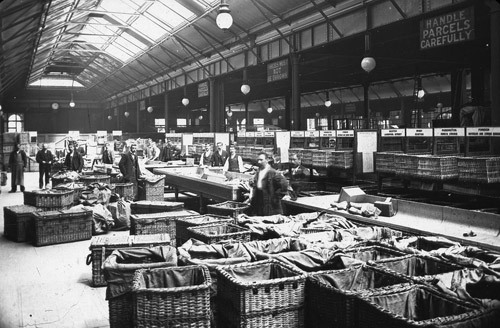 This service carried parcels overnight along the principle routes out of London, which for such heavy mails were a cheaper alternative that the railways. At Leicester Square a colander was posted to a resident in the Temple, and one or two wooden spoons. At Euston, half a ham was found in one of the mails and at the Waterloo depot, cricket bats and tin kettles were among the articles dealt with. Accounts also include a coffin shaped package sent from a Poplar undertaker to a workhouse master in Norfolk… Perhaps my favourite ‘strange enclosure’ tale is that of a gentleman who requested that the Post Office deliver a snake! After an initial refusal, the customer explained that the snake was in fact a pet ‘who had been on a visit’ (sadly the account does not specify where it had been!) and it was subsequently delivered by special messenger. Perhaps not surprisingly, Parcel Post was not a financial success at first. The estimates for both the number of parcels sent and the average weight – estimated by Baines at 7d a parcel, but on average only 5½d – were higher than those realised. By 1885, the Post Office was handling 26.5 million parcels per annum, increasing to 50 million by the 1890s. 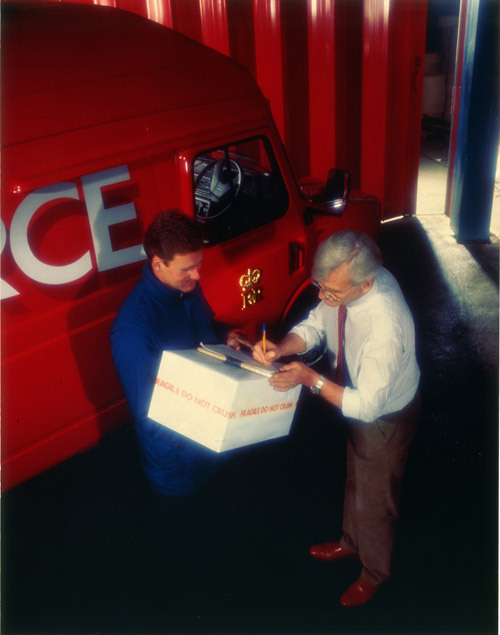 Fast forward to the 1980s and the now Royal Mail were still the number one parcel carrier, processing and delivering 175 million packages annually, using 30 special parcel sorting centres and a fleet of 27,000 vehicles. Competition from private competitors has had a significant impact on parcel services, but many the innovations brought about by the introduction of the Parcel Post helped to shape the modern Post Office and the organisation which most of us are familiar with today. Visit us on Flickr to see images of the Parcel Post dating from the 1880s to the 1980s. 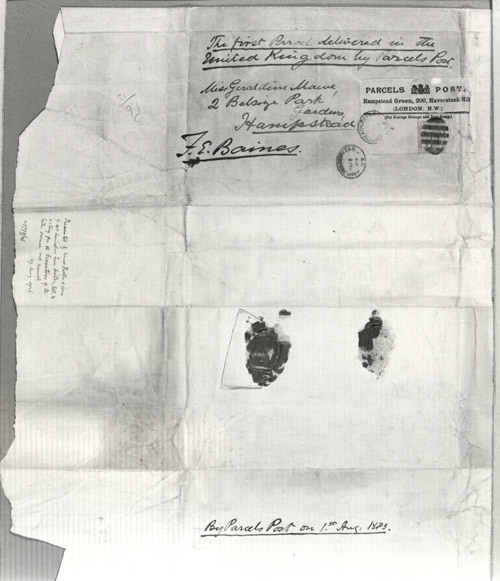 This entry was posted in Postal History and tagged General Post Office, GPO, Henry Fawcett, mail, packages, parcel post, Parcelforce, parcels, post, Post Office, Royal Mail. Bookmark the permalink. Have you any interest to sell/promote any of my 2 books on postal history. and the second one is out since 1 week : French Postal History in Tripoli (1852-1914).